Cyrus 6a review | What Hi-Fi? The Cyrus 6a has become something of a favourite son in the amp world. 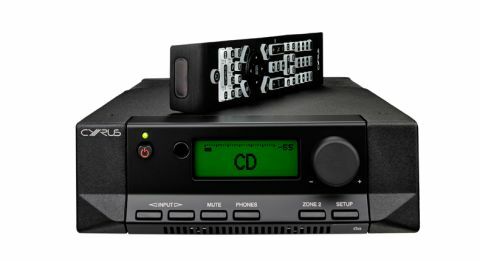 It won an Award after it appeared in 2012 and – despite being dethroned by the Naim Nait 5si a year later – has kept hold of its five-star status ever since. Until now, that is. Naturally, it does what Cyrus products do best: deliver an articulate, quick-footed sound that’s as precise as any at this level. Put it to the test with alt-J’s Something Good and the Cyrus plays to its strengths. The snappy bassline is delivered with impeccable timing, and each layer of the dense track is given a place and purpose in the presentation. It wouldn’t be much of an exaggeration to label the Cyrus a ‘perfectionist’ when it comes to organisation – John Williams’s intricate Born on the Fourth of July theme demands stringent arrangement and the Cyrus duly ups its game, keeping tabs on underlying string sequences and intermittent harps. There’s plenty to applaud in the 6a’s cool and calculated manner, though we’d like more fire. Its analytical approach is a trade-off for liveliness, and as a result upbeat songs lack the get-up-and-go to get us foot-tapping as usual. The Creek doesn’t quite have the Cyrus’s timing, but we find its expressiveness and energy more entertaining. Yet ease into Eminem’s The Monster and there’s plenty of low-end punch when the bassline kicks in. It’s revealing, too, the Cyrus spitting out lyrics with venom and digging out the quips in his rap. It doesn’t possess the dynamic agility of the Rega, nor quite muster the Naim Nait 5si’s sense of power and drive, but what it lacks in outright muscle it makes up for in scale. And, typically for Cyrus components, there is a long upgrade path – starting with a factory upgrade from the ‘6a’ to a higher-end Cyrus 8 model (for an added £700). Once that upgrade is done, you can add the PSX-R outboard power supply (suddenly now costing £745), which takes performance to a whole new level. Elsewhere there are a decent number of analogue inputs, a headphone output and both pre-out sockets (for use with an add-on power amp) and Zone 2 outputs (to, for example, feed a second source to another room). There are twin speaker outputs for bi-wiring available, too. Anyone familiar with a Cyrus product will recognise the amp’s long and narrow aluminium chassis (available in brushed-black or quartz-silver) and dated-looking black-on-green display. We’ve long been fans of Cyrus’s striking signature design, though we’re surprised to find the 6a’s volume dial a bit wobbly. We don’t remember that. The remote has (thankfully) changed since the amp’s first appearance – the new handset is as good as you should expect at this price, with a tall, robust frame and sophisticated backlit buttons. The Cyrus 6a might not be at the very top of the league anymore – it has been leapfrogged by more exciting and powerful rivals – but it remains a good-value amp. It’s fast, insightful and as precise as any stereo amplifier at this level. We’re still big fans of it, even if we have to deduct it a star.